This book provides a concise and didactically structured presentation of nanotechnology as matters stand. Both students and engineers can gain valuable insights into the historical development, production, and characterization procedures of structures in the nanometer range, their electrical applications, measuring procedures for the determination of nanodefect, nanolayer, and nanoparticle characteristics, and the major techniques of preparation in nanotechnology. Based on known facts, an evaluation of nanotechnology, its further development, and its future prospects are attempted. Nanotechnology is a technology on the verge of commercialization. 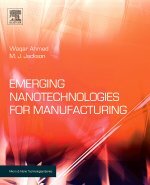 In this important work, an unrivalled team of international experts provides an exploration of the emerging nanotechnologies that are poised to make the nano-revolution a reality in the manufacturing sector. From their different perspectives, the contributors explore how developments in nanotechnology are transforming areas as diverse as medicine, advanced materials, energy, electronics and agriculture. Properties of nanosilicon in the form of nanoparticles, nanowires, nanotubes, and as porous material are of great interest. They can be used in finding suitable components for future miniature devices, and for the more exciting possibilities of novel optoelectronic applications due to bright luminescence from porous silicon, nanoparticles and nanowires. Nanophotonics has emerged as a major technology and applications domain, exploiting the interaction of light-emitting and light-sensing nanostructured materials. These devices are light-weight, highly efficient, low on power consumption, and are cost effective to produce. When solids are reduced to the nanometer scale, they exibit new and exciting behaviours which constitute the basis for a new generation of electronic devices. Nanotechnology for Microelectronics and Optoelectronics outlines in detail the fundamental solid-state physics concepts that explain the new properties of matter caused by this reduction of solids to the nanometer scale. Applications of these electronic properties is also explored, helping students and researchers to appreciate the current status and future potential of nanotechnology as applied to the electronics industry. In recent years there has been a huge increase in the research and development of nanoscale science and technology. Central to the understanding of the properties of nanoscale structures is the modeling of electronic conduction through these systems. This graduate textbook provides an in-depth description of the transport phenomena relevant to systems of nanoscale dimensions. In this textbook the different theoretical approaches are critically discussed, with emphasis on their basic assumptions and approximations. The book also covers information content in the measurement of currents, the role of initial conditions in establishing a steady state, and the modern use of density-functional theory. Topics are introduced by simple physical arguments, with particular attention to the non-equilibrium statistical nature of electrical conduction, and followed by a detailed formal derivation. This textbook is ideal for graduate students in physics, chemistry, and electrical engineering. 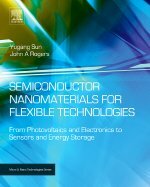 This book is an overview of the strategies to generate high-quality films of one-dimensional semiconductor nanostructures on flexible substrates (e.g., plastics) and the use of them as building blocks to fabricating flexible devices (including electronics, optoelectronics, sensors, power systems). In addition to engineering aspects, the physics and chemistry behind the fabrication and device operation will also be discussed as well. Volume 1, Metal and Semiconductor Nanowires covers a wide range of materials systems, from noble metals (such as Au, Ag, Cu), single element semiconductors (such as Si and Ge), compound semiconductors (such as InP, CdS and GaAs as well as heterostructures), nitrides (such as GaN and Si3N4) to carbides (such as SiC). Micromanufacturing and Nanotechnology is an emerging technological infrastructure and process that involves manufacturing of products and systems at the micro and nano scale levels. Development of micro and nano scale products and systems are underway due to the reason that they are faster, accurate and less expensive. Moreover, the basic functional units of such systems possesses remarkable mechanical, electronic and chemical properties compared to the macro-scale counterparts. This book explains the basic physics that governs the properties of carbon nanotube devices, including applications in electronics, nanoelectromechanical systems, field emission, optoelectronics and sensing. This book is an overview of the strategies to generate high-quality films of one-dimensional semiconductor nanostructures on flexible substrates (e.g., plastics) and the use of them as building blocks to fabricating flexible devices (including electronics, optoelectronics, sensors, power systems). In addition to engineering aspects, the physics and chemistry behind the fabrication and device operation will also be discussed as well. Internationally recognized scientists from academia, national laboratories, and industries, who are the leading researchers in the emerging areas, are contributing exceptional chapters according to their cutting-edge research results and expertise. This book will be an on-time addition to the literature in nanoscience and engineering. It will be suitable for graduate students and researchers as a useful reference to stimulate their research interest as well as facilitate their research in nanoscience and engineering. 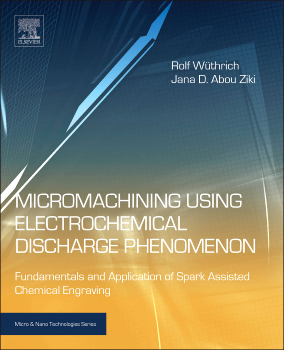 Micromachining Using Electrochemical Discharge Phenomenon presents an unconventional and largely unknown technology, which is able to micro-machine at relatively low cost glass, polymers and other materials. This process is called Spark Assisted Chemical Engraving (SACE), or Electro Chemical Discharge Machining (ECDM). First presented in 1968 in Japan by Kurafuji and Suda, this technology was studied essentially in the academic world and mainly applied for micro-fluidic devices. Integrated Nanophotonic Devices unlocks the technologies that will turn the rapidly growing research area of nanophotonics into a major area of commercial development, with applications in telecommunications, computing, security and sensing. As miniaturization, batch fabrication, and integrated electronics rapidly enable the development of a broad range of smart products, MEMs, MOEMS, and NEMS are creating enormous opportunities for commerce and functionality. This significant and uniquely comprehensive five-volume reference is a valuable source for research workers, practitioners, computer scientists, students, and technologists.